" I've used Zim Zam Zoum in demonstration lessons with eleven classes in the past two days *. The content, pace and animations come together brilliantly to promote enjoyment and learning, with subtle touches and a driving theme song that has everyone dancing and smiling. The children and teachers love it and it has instantly become a key part of my toolkit. I'm buying site licences for every Hackney primary school that does French, and would recommend other local authorities do the same. " " ZIM ZAM ZOUM is excellent, very successful. The children love it as it is so interactive...it also allows you to go at your own pace, suited to age group and ability, as you can pick and choose bits that are suitable "
The ZIM ZAM ZOUM products are high-quality French teaching and learning resources for children based on the combination of catchy, tuneful songs and strong visuals. In the software, the delightful graphics are brought to life through full animation of each song to illustrate meaning and aid comprehension. Every song is crafted to incorporate as much useful language as possible, so that it acts as a springboard to conversation, exploiting rhyme, rhythm, repetition and melody to stimulate and engage children. The melodic tunes are not only invitingly singable, but also make French dialogues easy to remember! You will find that the songs are so catchy that the children will still be singing them as they play and will teach them to their siblings ! All vocals are by native French speakers, mainly children. Separate backing tracks enable karaoke and pupils can even record themselves and compare! There is also a story aspect to each song which lends itself to mime and performance in the classroom and at school concerts. I hope that using ZIM ZAM ZOUM to help your children learn French, whether at school or in the home, will give you as much pleasure as we at Taught By Song have had in creating it ! The emphasis is very much on fun learning for pupils as well as time-saving for us busy teachers. The Promethean version for the classroom is especially packed full of interactive content, with 24 flipcharts, comprising hundreds of ready-made bespoke activity pages. Both versions of software have engaging activity sheets to print off and use to consolidate learning. Relax, sing and enjoy with your children as they learn ! Taught By Song is based in Oxfordshire and dedicated to providing high quality resources for foreign language teaching, using the powerful medium of song. Our resources are the original, bespoke product of a tight creative team of specialists, who are still working at the frontline of education and are therefore right in touch with the needs of both teachers and learners. Monica Hyde has taught French at both KS1 and KS2 for over 12 years and she is still actively teaching French at primary level. Building on her first-hand experience of how children learn a foreign language in the classroom setting, she has written songs which have an engaging, often funny storyline as well as incorporating plenty of repetition and progressive vocabulary substitution. With her experience of how to make French fun for young learners, she has created a progressive scheme of activities for the interactive whiteboard, which are a blend of her own ideas and best practice vocabulary games. John Hyde is an established composer, with more than twenty years experience of writing for film and television, with a particular track record in children's TV. John has an enviable talent for composing memorable melodies in a variety of styles that appeal to all ages of children and adults alike! He also brings his professional recording expertise to the production of high quality music. Capital Multimedia have created and animated the graphics, drawing an engaging and vivacious gang of characters and animals ! They bring to the excellent drawing and animation their own particular brand of charm and wit, together with linguistic accuracy to the lip synchronisation of the singing characters. 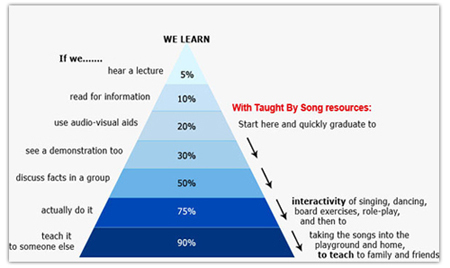 Why do we use song as the basis for our teaching resources? From research into how we learn, it is now well established that young children benefit hugely from the rhymes, patterns, repetition and rhythms of nursery rhymes and songs when learning their mother tongue, in order to develop the cadences of the language and speak with fluency and confidence. Such stimulation promotes accurate listening and also builds memory skills. Children who are brought up with rhymes and melodies start their school-life with more finely developed skills in both oracy and literacy. It is therefore quite natural that the same effect should be noted in the learning of a second language. If 90% of learning is achieved through teaching the subject to others, song is invaluable, as it is the most natural vehicle for children to use to convey their learning to someone else. They sing to their families in the car on the way home from school, to their younger siblings in the bath and to their Grannies and Grandads on weekend visits! We have been so impressed by the weight of evidence that shows how music and rhyme enhance learning, that we have named our company TAUGHT BY SONG and have chosen to place song not just as a bolt-on extra, but as the focus of our new Primary French teaching programme, ZIM ZAM ZOUM.